Martingale is one of the most popular betting strategies worldwide dating back to the XVIII century in France which still keeps inspiring bettors (tipsters) and brings profits to them since then. The strategy is well known amongst roulette players but it is much more profitable when betting activity and we are going to prove that. 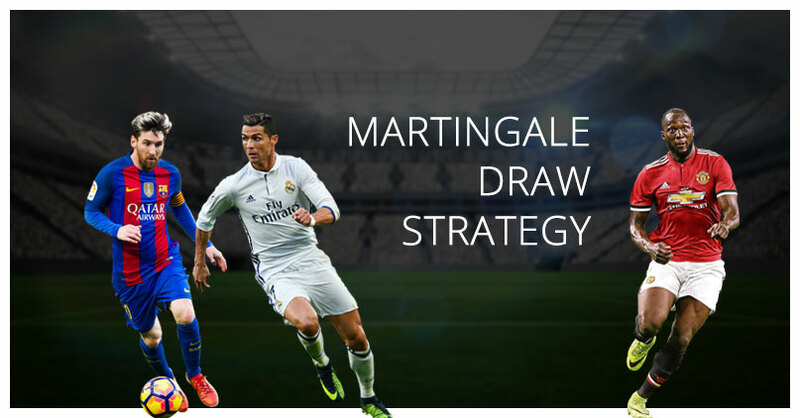 Martingale draw strategy is based on tips placed on draw full time result of a particular match followed by a mathematical algorithm if (in case of) losing bet. The philosophy of Martingale draw strategy is pretty simple. One place an odd before the start of a certain game that it will finish draw and if they lose they bet once again this time double the previous bet. Basically one keeps doubling the bet until they win. At the time a winning bet is there it is paying off for all the lost bets before but it is also bringing the player profit even bigger than the original stake that has been made. We would like to give an example: you bet 10 EUR that a certain game will finish draw but you lose. You pick another game which has to finish draw but this time your bet is 20 EUR. You lose again. You pick a third game that has to finish draw with a multiplier 3.0. Your bet is already 40 EUR. The final whistle blows and the match ends draw so you win 40 x 3 = 120 EUR while all your previous bets combined equal 10 + 20 + 40 = 70 EUR which leads to the conclusion that 120 – 70 = 50 EUR profit. This strategy requires exceptional bank resources so formulate your staking plan very well! A factor that is of a great importance is to pick odds with a multiplier = or greater than 2.0. Always consider wisely your bets, do a proper research, investigate the form of both teams, head to head and how often they end draw. Which tournaments do we have to choose? The level and the quality of football is not very high and teams are often happy with even games. Over 35% of the matches in the last season have finished draw. Perugia is the team with the highest even results overall rate taking 20 draws in 42 games. The strong defense and the weak scoring are typical for the Iranian teams. Statistics show a total of 34% draw results for the whole season which turns it into a league that needs to be noticed. Gostaresh Tabriz is the team with most draw games with a rate of 17 out of 30 for the season. 32 % full time draw games for the last season. Every team in the championship has between 10 and 14 games that ended draw out of 30 matches for the season. Over 30% full time draw games rate. Valenciennes and Laval have record high of matches that ended with even scores each reaching 15 draws out of 38 games.